Operation DRAGON ROUGE, RED DRAGON in English, was one of the most dramatic military missions undertaken during the Cold War. 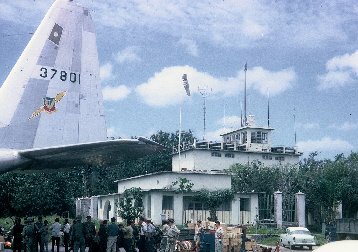 It involved a flight of more than 4,000 miles by USAF C-130s carrying paratroopers of the crack Belgian 1st ParaCommando to rescue hostages who had been held for more than three months in the Congolese city of Stanleyville. Africa was an unstable place in the 1960s, even more so than it is today. The former Belgian Colony of Congo, now known as Zaire, was granted independence in 1960, and almost immediately became the site of chaos. When the crisis ended in early 1964, a new one broke out as Congolese rebels calling themselves "Simba" rebelled against the government. The Congolese government turned to the United States for help. In response, the US Strike Command sent JTF LEO, a task force made up of a detachment of C-130s, communications personnel and and 82nd Airborne security team, to Leopoldville. By early August, 1964 the Congolese, with the help of the LEO force and a group of white mercenaries led by Major Mike Hoare, was making headway against the Simbas. In retaliation, the Simbas began taking hostages of the whites in areas under their control. They took them to Stanleyville and placed them under guard in the Victoria Hotel. While the world watched anxiously, in Washington and Brussels the United States and Belgium were hard at work trying to come up with a rescue plan. Several ideas were considered and discarded, while attempts at negotiating with the Simbas failed - no one could be found to negotiate with! In mid-November the C-130Es and crews of the Tactical Air Command rotational squadron from Pope AFB, NC were called back to their temporary duty base at Evreux-Fauville AB, France from missions throughout Europe. The crews were told simply to go to their barracks and get some rest, because something big was brewing. On Tuesday evening, November 17, the crews were told to report to the operations room on the Margarite where the airplanes were deployed. The crews were told to rig seats and take-off. Just before take-off, each navigator was given a Manila envelope and instructed not to open it until their airplane had reached 2,000 feet and there were no mechanical problems to make them turn back. When the crews opened the envelopes, they learned they were going to Klinebrogel, a Belgian military airfield outside Brussels. When they got to Klinebrogel, each airplane loaded with paratroopers wearing red berets, then took off again after being handed another envelope. This time it told them to head south for Moron AB, on the Spanish Mediterranean. At Moron the navigators went into Base Operations where they were given maps and instructions for the next leg of their flight, to Ascension Island in the South Atlantic, where they arrived 18 hours after leaving France. By this time everyone knew they were on their way to Africa, but first there was a time of "hurry up and wait" on secluded Ascension, where the rescue force was out of sight of the prying eyes of the world. While they waited, the American airmen and Belgian paras got to know each other, and began working out procedures to drop the Belgians. On Sunday before Thanksgiving the force left Ascension and flew across the Atlantic and much of Africa to Kamina, an airfield in the southern Congo. There the crews and paratroopers waited again. By this time all hopes of negotiation had vanished, and that evening the American and Belgian commanders were told to launch Operation DRAGON ROUGE. 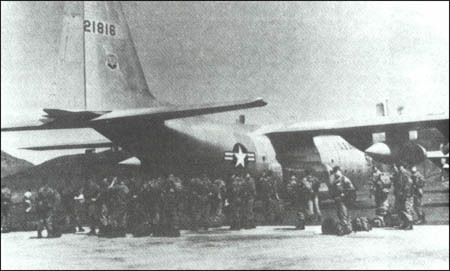 In the early hours of November 23, 1964 five C-130s took off from Kamina, each with 64 Belgian Red Berets in full combat gear seated on the red nylon troop seats in its cargo compartment. Behind the assault force came seven more Herks, with Chalk 12 configured as a hospital ship. 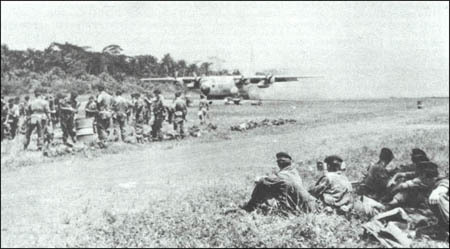 The C-130s flew north at high altitude, then dropped down to treetop altitudes to follow the Congo River as they neared the city of Stanleyville. 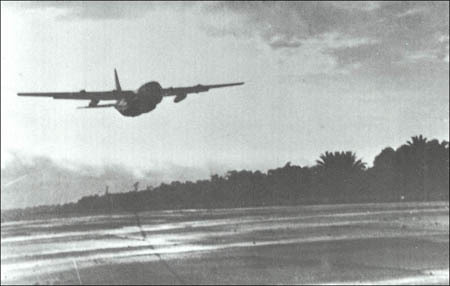 As the sun was breaking over the horizon out of the African Veldt, a CIA A-26 INVADER flown by a Cuban mercenary pilot made a strafing pass over the Stanleyville Sabenas airport. Right behind the A-26 the first C-130 roared low over the runway. 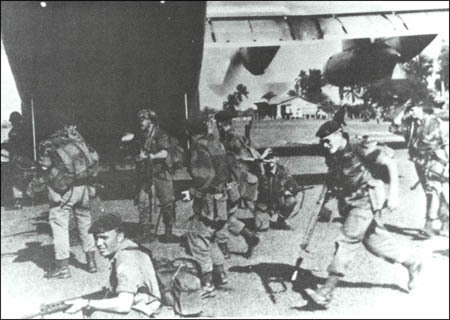 As the airplane came over the field, paratroopers led by Col Charles Laurent spilled from the doors on either side of the airplane. 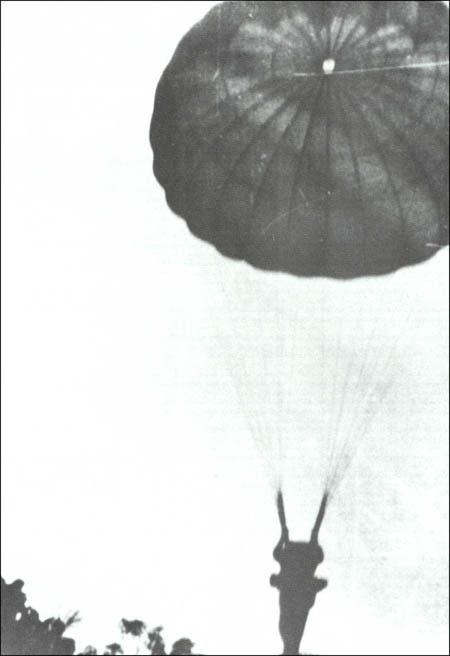 Within seconds, 310 paratroopers were in the air, then landing on the strip of grass alongside the runway. The five jump planes came around for another pass to drop the jumpmasters and bundles of equipment. As the airplanes came off the drop zone, they began taking fire from a .50-caliber machinegun. After dropping the troops, Chalks Two through Five left the area for Leopoldville, where they were to refuel and stand-by. Chalk One, carrying the C-130 mission commander, Colonel Burgess Gradwell, and flown by Captain Huey Long of the 777th TCS, orbited over the airfield until they were hit by several heavy shells that knocked out hydraulics. Long pointed the battle-damaged airplane toward Leopoldville. Forty-five minutes after he jumped, Col. Laurent reported that the airfield was secure. Five other C-130s roared in for assault landings from their orbit point near Stanleyville. Each airplane discharged troops and vehicles to join the paratroopers on the ground, then took off again and headed to Stanleyville. Meanwhile, Chalk Six, flown by Captain Mack Secord's crew, approached Stanleyville. They had lost a life raft after takeoff from Kamina and had to return for the spare airplane. Secord was told to land, and wait with Chalk Twelve, the hospital plane, until the Belgians returned to the airport with the hostages. 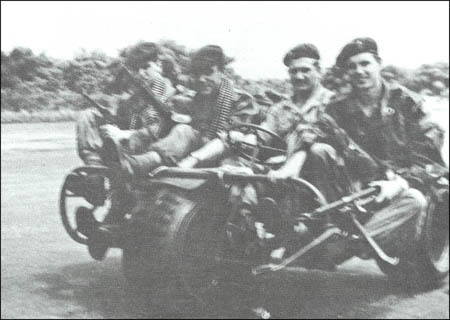 After leaving the airport, the Belgian rescue team made haste to reach the Victoria Hotel before the Simbas carried out their threats to kill the hostages if a rescue was attempted. Several blocks from the hotel a paratrooper rounded a corner just in time to prevent the Simbas from firing a second volley of shots into the assembled hostages, who had evidently been walking toward the airport. Some of the hostages later said they thought the Simba officers intended to turn them over to the Belgians unharmed, but some of the Simbas, who had been drinking and smoking Hemp all night the night before, decided to take matters in their own hands. They shot their own officers, then turned their guns on the hostages. 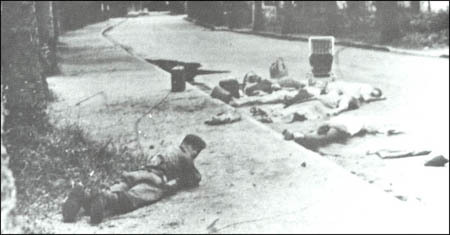 They had fired one volley, picking women and children as their targets, and were preparing to fire another when the Red Berets showed up on the scene. At the sight of the Belgians, the Simbas lost their courage and ran! After more than an hour on the ground at Stanleyville, Mack Secord's crew finally saw the first hostages coming toward them. As they were the most badly injured, they had been driven to the airport. Seeing the engines running and thinking the C-130 was about to take-off, the frightened whites rushed aboard the airplane through the open rear ramp. Secord's loadmasters, there were two aboard, tried to get them over to the other airplane where a doctor waited to tend their wounds. After finally getting the most seriously injured people to leave, Secord's crew closed up their airplane and began taxing for the runway. As they passed a clump of elephant grass, a pair of Simbas ran out. One ran alongside the airplane trying to get inside the door while the other sprayed the underside of the wing with a submachinegun. No one inside the airplane knew what had happened; the whole thing was witnessed by the crew of Chalk 12. Secord took off and headed for Leopoldville. When he got there, he had to be bodily lifted from the airplane and taken to the hospital where he was treated for a brain concussion he had received the night before when he bumped his head getting into the airplane. For the rest of the day, C-130s and other transports shuttled between Stanleyville and Leopoldville. More than 2,000 people were airlifted out of the city. That night a Belgian mechanic working on a DC-4 was killed by sniper fire. Several times during the day the field was mortared, and every airplane was hit by ground fire during their landings and takeoffs. One was hit in a wing fuel tank. The airplane crew chief whittled a plug from a broom handle and wrapped it with a rag and used it to plug the leak. The airlift continued the next day. Late in the day the Belgians were pulled out of the city and flown to Leopoldville. Early the next morning a smaller scale mission designated as DRAGON NOIR/BLACK DRAGON, freed hostages held at Paulis, a town 225 miles northwest of Stanleyville. The hostages at Paulis had also been harmed by the Simbas. 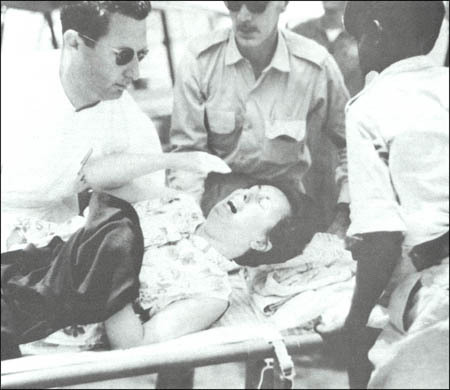 An American missionary had been beaten to death during torture. After DRAGON NOIR, the rescue force retired to Kamina to await further orders. While they were waiting, an African thunderstorm prompted one C-130 crewmember, none of whom had had a bath in days, to grab soap and go out into the rain for an impromptu shower. The rest of the force followed his lead as the airmen and paratroopers ran around naked in the rain! A few days later, in response to political pressure from the Third World, President Lyndon Johnson ordered the force ouf of Africa. 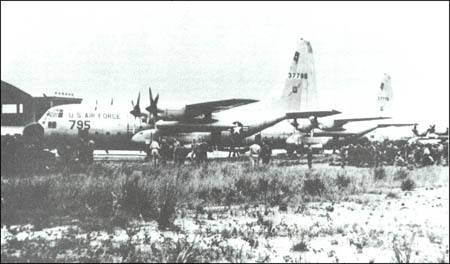 For their role in DRAGON ROUGE, the C-130 crewmembers recieved the 1964 MacKay Trophy for the most meritorious flight of the year by USAF aircraft. All of the crewmembers were decorated with the Air Medal, while Captain Mack Secord received the Distinguished Flying Cross.